Welcome to the second installment of VMAC’s three-part blog series centered around Cullen Diesel, the Detroit Diesel and MTU distributor for BC. Cullen Diesel mechanics are factory trained and certified in Detroit Diesel and Mercedes engines, and often work in challenging and remote locations in the logging, marine, mining, and industrial sectors. 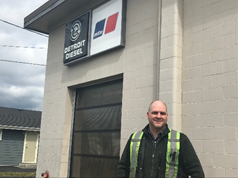 Dennis Miskow, Branch Manager of Cullen Diesel’s Vancouver Island, BC operations took some time to speak with VMAC about Cullen’s fleet, and his decision to choose a Mercedes-Benz 4×4 Sprinter in Part 1 of the Van Series Air Compressor blog. In Part 2 of the series, Dennis explains why he chose an UNDERHOOD™ 40 Van Series Air Compressor instead of a gas drive air compressor, what he likes about the UNDERHOOD™, and his advice to anyone considering an UNDERHOOD™ for their commercial van upfit. 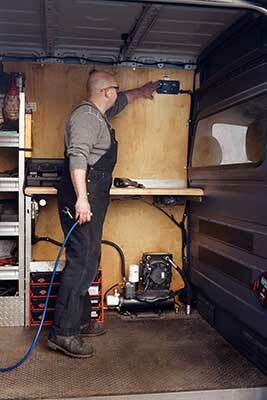 Selecting A Van Air Compressor: UNDERHOOD™ or Gas Drive? When it was time to upgrade an aging service truck, Dennis Miskow ended up choosing a Mercedes-Benz 4×4 Sprinter van. Next, he planned the upfit with Sterling Fleet Outfitters, a commercial van and truck equipment upfit company. Dennis was pleased to find this upfitter was very experienced in cargo van upfits and had plenty of options specifically designed for Cullen’s Sprinter van. When it came time to choose the air compressor, Dennis took the time to reflect on the performance of Cullen Diesel’s current gas drive air compressor. 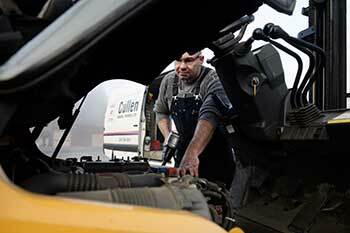 Unfortunately, these problems are not uncommon for many mobile mechanics. 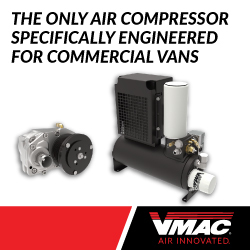 However, with the surge in popularity of commercial vans comes an increase in the development of specialized equipment, like the UNDERHOOD™ 40 Van Series Air Compressor, the only air compressor that has been specifically engineered for commercial vans. The placement within the engine compartment saves space in the cargo area and solves common safety issues, like toxic fume exposure and risk of gas fires, faced by many operators with standalone gas air compressors installed in the cargo area. With the UNDERHOOD™ 40, the only space required in the cargo area is 1.7 cubic feet for a combined air/oil cooler and air/oil separator tank. Dennis worked with VMAC National Sales Representative Darren Darnley to get the Cullen Diesel Mercedes-Benz 4×4 Sprinter van upfitted with the UNDERHOOD™ 40 Van Series. “Darren was great to work with. He was the point-person, and he gave the same high level of service we would give to our customers,” notes Dennis. Like with any investment in new equipment, Dennis did have some concerns, mainly about cost. “The Van Series Air Compressor is more expensive than a gas drive air compressor, and I also wondered if the UNDERHOOD™ was too much power for our applications, as it’s rated for up to 40 CFM.” However, once the UNDERHOOD™ was installed on the van and his mechanics were using it, he had no more doubts. As Dennis mentioned in Part 1 of the blog series, adding another commercial van to the Cullen Diesel fleet is in the plan. “I want to get another van, and when we do, it absolutely will have another UNDERHOOD™ 40 Air Compressor on it,” says Dennis. Subscribe to the VMAC Blog to continue reading about Cullen Diesel’s experience with a service van, and the specialized equipment it comes with. In part three of the series, which will be released next, Dennis will share what a typical service job with Cullen Diesel entails, and how the UNDERHOOD™ 40 Van Series Air Compressor is enabling his mechanics to work more efficiently. You can also go back to read part 1 of the series: Cullen Diesel Chooses Mercedes-Benz 4X4 Sprinter Van Over Service Truck.